Emily is first. Her head is sculptured with a mix of Living Doll Clay, Mould Maker and Blue Fimo Clay. Her eyes are made from white clay and inserted into her face before baking. After baking her cheek was carved away and a white bone was added using a bit of TLS to act as a glue between the cooked and uncooked clay. She was then painted in Genesis Heat Set Paints. I have eyelashes for her, but will add once all her baking is done. Emily’s torso is sculptured. When I mixed the clay for these dolls I ensured I made enough to create the entire doll, trying to mix more of the exact colour would be almost impossible. Her ribs will be added a later stage just like her cheek was done. 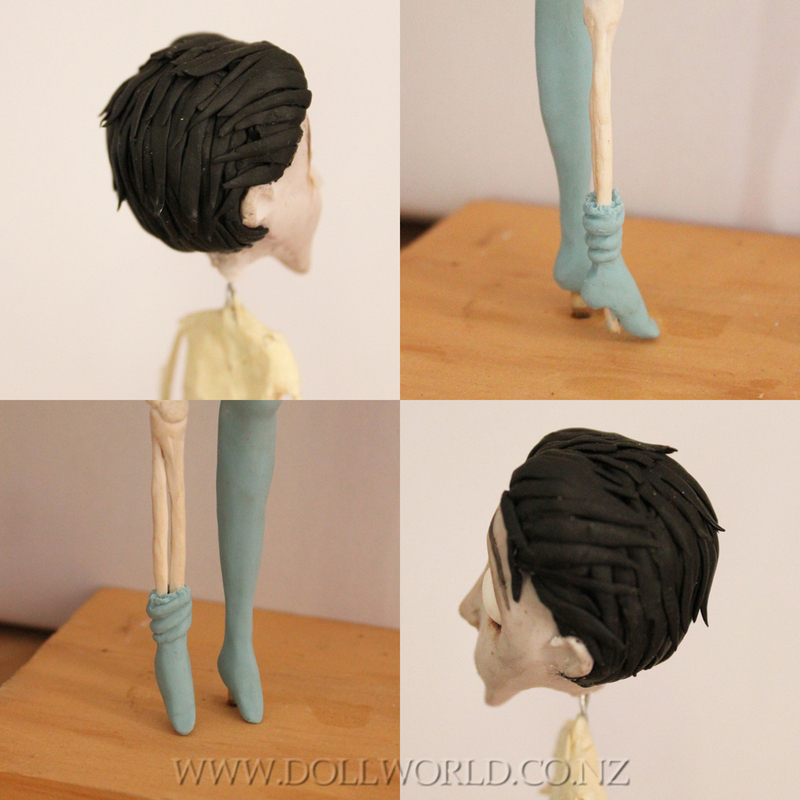 Emily’s flesh leg is completed and her flesh foot on the skeleton leg, including her leg warmers made from her skin). Her feet are made smaller than required allowing for white clay to be added later to create her shoes. Victor’s hair is made from layers and layers of black spaghetti strips that have been flattened. And a close up of Emily’s skin leg warmers.